Private sessions – call for an appt. Rahbe will be creating a quantum healing experience with her 10 Crystal bowls and wooden flutes! These acoustic instruments resonate with wind, water, wood, fire and earth and resonate with the different organ meridians in the body. This concert is experiential and is for EVERYONE! This concert is a great event to bring your friends and family to that you may have been reluctant to invite ! Rahbe will be performing at Mayo Clinic with less bowls for the cancer center in the near future as there is a lot of scientific studies going on about sound therapeutic healing . There is a fee for this concert and it is $20.00 per adult, however I have arranged for each of the paying guests to go home with a CD of your choice of Rahbe’s music!! (Couples who wish to only have one CD will be at $25.00). Rahbe will be offering private sound therapy sessions with her 10 bowls. Private sessions are $80.00. Call for an appointment. In 2001, she began training with Fabien Maman and the Academy of Sound, Color and Movement, www.tama-do.com. Sound Therapy: “treatment based on the finding that human blood cells respond to sound frequencies by changing color and shape, and the hypothesis that therefore sick or rogue cells can be healed or harmonized by sound. The therapy was developed and researched by French musician and acupuncturist Fabien Maman.”– Webster’s New Encyclopedic Dictionary 1993. She has since completed Levels I & II in the South of France and participated in further workshops in New York, California, Michigan and Illinois. As a classically trained music teacher and conductor, Rahbi holds two Master Degrees, one in Music Education and another in Choral Conducting. With a passion for orchestral conducting, Rahbi devoted 6 years to further an orchestral conducting career by participating in professional conducting workshops with the American Symphony Orchestra League and the Conductor’s Guild and International workshops in the Czech Republic with the Zlin professional orchestra. Rahbi layers sound to produce optimal relaxation and quantum healing and currently has three CDs, which have been produced with the guidance of Rehabilitation Psychologist, Dr. Kenneth Dennis, www.AmericanMindfulness.com. Besides her extensive musical skill and training, Rahbi brings to her music her own emotional and spiritual depth. Devoted to ongoing spiritual growth, she has extensively studied Sacred Scriptures and texts and has practiced Hatha Yoga, Qui Gong, forms of Tai Chi and Tao Yin Fa. She is a Reiki Master and Oneness Blessing Giver. 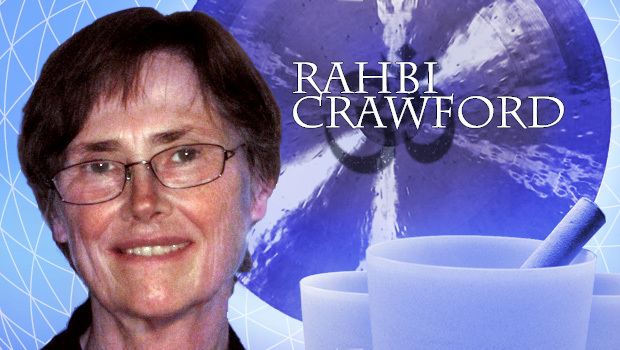 Rahbi (Roberta) Crawford has accepted her calling as a Musical Mystic. (Mystic: A seeker of Spiritual truths). One of the truths is that to be in balance we must honor our bodies, mind and emotions as well as spirit. Rahbi’s concerts are an opportunity to experience music as vibrational or energy medicine. Since everything vibrates, crystal bowls and acoustic instruments can shake up stagnant energy and restore energy flow to mind, body, spirit and emotions. Rahbi’s music offers invigorating harmonies to reprogram and retrain all systems into a balanced and functioning whole. Rahbi’s recorded music is designed to still the conscious mind to allow deep and multi level healing. By promoting greater awareness of limiting emotional and mental patterns, it can stimulate change and promote a positive healing response when used in conjunction with other healing modalities. Chakras are important energy centers of the body. When activated, they stimulate and interact with all the electromagnetic fields that hold these patterns. We are all familiar with the tremendous power of sound to energize our bodies and soothe our spirits, whether we experience it in the form of rousing music or in the hushed noise of waves on a beach at night. 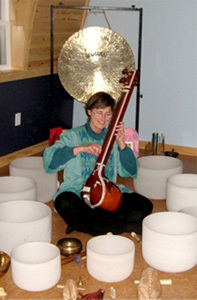 A pioneer in the revolutionary new field of sound medicine, Dr. Mitchell Gaynor, a leading oncologist and director of integrative medicine at the Strang-Cornell Cancer Prevention Center, has been using sound as complementary therapy in the form of chanting, music, and quartz crystal bowls to treat patients since 1991 with remarkable results. In Sounds of Healing, he shares his philosophy and sound-based techniques for self-healing, which can be used by anyone, whether faced with a life-threatening disease or simply seeking relief from the stresses of daily life. Sound, voice, and music are potent tools for restoring the inner balance of the body and awakening the spirit. Dr. Gaynor explores the science behind how and why sound and vibration affect us on a physiological level and outlines the sound traditions and practices that promote relaxation and body-mind healing. Rooted in the musical principles of entrainment, resonance, toning, and harmonics, his methods help us achieve overall wellness, greater energy, and the realization of our highest spiritual potential. Dr. Gaynor also describes his unique vision for a holistic approach to medicine that treats the whole person and creates the conditions for a higher quality of life. An extraordinary blend of science, music, and spirituality, Sounds of Healing is an enlightening, inspiring guide to fostering inner harmony and tuning in to the music of our own souls.